What are the most important skills for literacy? The phonological processor usually works unconsciously when we listen and speak. It is designed to extract the meaning of what is said, not to notice the speech sounds in the words. It is designed to do its job automatically in the service of efficient communication. But reading and spelling require a level of meta-linguistic speech that is not natural or easily acquired. Phonological awareness is critical for learning to read any alphabetic writing system. And research shows that difficulty with phoneme awareness and other phonological skills is a predictor of poor reading and spelling development. Don’t all schools teach phonics? It is necessary to teach phonics systematically, using a structured program. A systematic phonics approach or program is that a sequential set of phonics elements is delineated and these elements are taught along a dimension of explicitness depending on the type of phonics method employed. Jolly Phonics is a structured way of teaching communication skills. It leads through the natural progression of listening, as a young baby, through to speaking and eventually reading and writing. 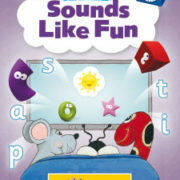 Jolly Phonics focuses on teaching letter sounds in an exciting and fun way. It is a solution to all those problems faced by teachers, children, parents and curriculum planners. Its flexibility, range of resources and multisensory approach made it successful. However it’s important to choose age appropriate materials while designing a school setup .It is important to use this program as a whole to achieve excellent results. Jolly phonics is equally good for schools and homeschooling, children with low socio economic back grounds and from high profile families, for boys and girls, for native and bilingual and even trilingual students, for children with average performance and children with special needs. Continues to revise and extend children’s phonic knowledge. Flexible and easy to implement in any setup. Developed by 2 classroom teachers through experiments and research. Using Jolly phonics but not getting desired outputs? It is important to use it as a whole to get desired results. A blend of programs will lead to confusion and stress on teachers and children. When do I start teaching the blending of sounds? After the first three sounds have been taught. After learning `s’, `a’ and `t’, students can now make the words `at’ and `sat’. As new sounds are taught you can build up the number of words to blend. No. All you really need is the `Phonics Handbook’, we can supply you with this resource. It contains everything you need to get you started including work sheets, flash cards and word boxes. Jolly Phonics has a really nice range of resources. Should the letter names be taught at the same time as the letter sounds? The recommendation in Jolly Phonics is that teachers should avoid introducing letter names until after the first few weeks of teaching letter sounds. This advice was recommended after teachers noticed that some children said the letter names whilst trying to blend a word and consequently failed to read the word. This problem only occurred when the letter names and letter sounds were taught at the same time. Why do you say that we have to wait three weeks before teaching the letter names? So that we don’t confuse children; the sounds the letters make are most important. After the first three sets of sounds have been introduced you can begin to introduce letter names. How do you teach the capitals and letter names? Children need to know both letter sounds and their names. The way I introduce letter names is by putting up an alphabet frieze that shows both upper and lower case letters. We sing the alphabet song using the letter names and again, using the letter sounds. I also use upper and lower case flash cards and teach them that although each letter is shown as a capital. It still makes the same sound as the lower case letter. Continue teaching a new sound every day and as you teach a new alphabet letter, teach the name by pointing it out on the alphabet frieze. Is it important to teach phonemic awareness before introducing letters? The simple answer to this question is no. The children develop phonemic awareness extremely well when they are taught synthetic phonics. When are children given reading books? During the first weeks we are focused on teaching children to break the “code” associated with reading (boys love it when you talk about “code breaking”). In the first eight to ten weeks we teach letter sounds, blending technique and the segmentation of words. We also teach irregular words that we refer to as “tricky”. Some teachers and parents find it hard not to give out reading books because this is a normal expectation in our culture. Unfortunately this does little for the child if they are unable to “break the code” of reading. By delaying this process and concentrating on letter sounds, blending and segmenting techniques, we actually produce higher reading abilities in a shorter time frame. Once children understand how the code works, they gain in confidence and enjoy reading as an activity so much more. Do I have to wait until my child has mastered the first six sounds before moving on to the next set of sounds? No. Jolly Phonics is a fast paced program where a new sound is introduced each day along with repetition of identified sounds until they are recognized automatically. I use flash cards extensively in this process. On the third day of the program, we use the first three sounds (s, a, t,), to form two and three letter words by “blending” them. As a new sound is introduced each day, the list of words we can make grows exponentially. By the time you have taught the first three sets of sounds, it is possible to make over seven hundred words from them! At school each child has a “sound book”, that the teacher or classroom helper reviews with them each day. 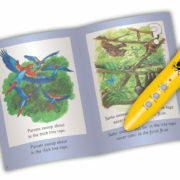 Each evening, the sound book is sent home for the child and parent to review. These reviews never take up more than a few minutes. My child is two and a half years old. Is it too soon to start teaching him to read and write? The timing and pace associated with children learning new skills is a very individualistic thing. I have had children as young as yours show a readiness for reading; they have liked to sit with me and explore what’s on the page of a book. In this setting, I start by pointing to a letter and emphasizing the sound it makes as we read (the Jolly Phonics letter groupings are my guide in this process; starting with s, a, t, etc). Most two-and-a-half year olds are more interested in picture books so it’s important to read lots of these books and then to ask questions like, “Where is the dog?” or, “show me the house”. As you read, put your finger underneath each word and move left to right across the page. The “I Spy” game is also helpful here. Say things like, “I spy a cat”, and the child finds the cat and so on. As you progress, you can increase your child’s listening skills by sounding out little words, for example, “Where is the m-a-n?” or, “Find the d-o-g”. 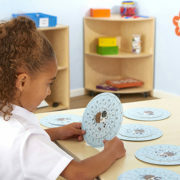 Young children need lots of activities to “tune-in”, their ears so they learn to differentiate different sounds. Preschool and day-care teachers use finger rhymes, songs, and musical instruments to help children listen. You can also do these activities at home. When do you introduce the 'tricky words’? Tricky words should be introduced after the fourth set of sounds. It is recommended that you teach two tricky words each week from that point. Don’t rely on `look-and-say’, ask children, “What is tricky about this word?” Their response will often surprise you. How many sounds do you teach each week? You should be teaching a new sound each day. Every day you must repeat the sounds until the children know them to automatically. I only see my kindergarten students for two full days each week so, maybe I should only teach two sounds per week? You should teach two sounds per day. Ask parents to go over the sounds that you have taught on the days that they are not at school. I find parents are often willing to help in this regard. What comes after Jolly Phonics? Jolly Phonics provide a structured program. After working through the Phonics Handbook, you follow-up with Jolly Grammar 1 which is often used in Grade 1. Jolly Grammar 2 follows for Grade 2 students. The Grammar Handbooks cover all of the basic grammar skills including parts of speech, spelling, punctuation, compound words, regular/irregular past tense and prefixes and suffixes. What can children learn from Jolly Phonics system? Children do not just learn the 26 letters of the English alphabet. They learn the 42 main sounds used in the English language. It is taught through a variety of multi-sensory and fun activities. We begin by telling a short story which leads into the sound and connected action. For example, ‘S’ is a snake in the grass. Even if adults find all the actions and sounds difficult to remember but you can guarantee the children will never forget! When should I start to use JP? You can start JP from age 2.Jolly Phonics system can be used with kindergarten students till primary school. What is a structured way of teaching? Playgroup classes begin with singing songs, sounds and actions. They also begin to color in sound sheets, trace letters using cards or Finger Phonic Books and begins with prewriting skills. What schools have been using Jolly phonics? In almost every other school, however some schools are using it in parts and some are using it as a whole program. How can we use Jolly Phonics effectively in classrooms and homes? One can use Jolly phonics very effectively in schools and homes by using true Jolly Phonics approach or Jolly ways of teaching as mentioned in the handbooks. Use of age appropriate resources is a must for its implementation and usage. Phonics Club Private Limited was founded in 2015 and is an independent non profit organization working to promote synthetic phonics approach in Pakistan and abroad. It is dedicated to improve quality of education through a diverse range of services: Teacher training,curriculum consultations ,student assessment and evaluation along with ongoing monitoring. Our commitment is to empower with knowledge the present and future generations of students. 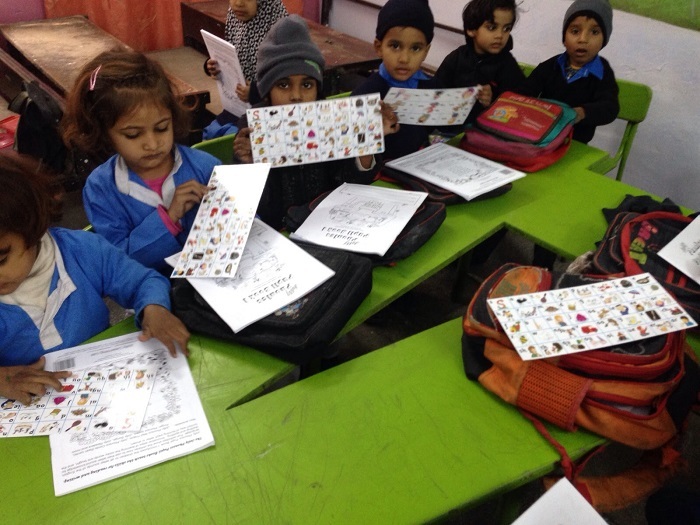 Fatima is a trainer and is currently running her newly opened Jolly Learning Centre (Phonics Club) in Pakistan, where children, parents and teachers now enjoy her lively training. She is working as a trainer and literacy consultant for various organizations. She provides Jolly Phonics and Jolly Grammar training along with the progression of concepts. She also organizes sessions and her enthusiastic and lively seminars demonstrate her passion for effective language instruction. She believes every child and teacher deserve to benefit from the synthetic phonics approach using Jolly Phonics program. She works closely with local education foundations, authorities and publishers. Recently working with Punjab Government and piloting Jolly phonics in low cost public and private schools. She has been impressed with the speed and enthusiasm of the children in learning with Jolly Phonics and she eagerly gives training to schools in the region, amazed how unbelievably well this method works if used effectively. She is acknowledged for her sessions on Teaching with products in Pakistan and abroad. She had planned curriculums and training sessions for various school systems from high to very low budget schools. Sadaf is an experienced teacher and the Head of Early Years Foundation Stage (EYFS) at her school. She is really passionate about learning and sharing her knowledge with others. Since implementing the Jolly Phonics programme in her school, children have shown tremendous results whilst becoming excellent readers and creative writers. Sadaf strongly believes that the ability to read and write is the basic right of every child and that no child deserves to be overlooked. Sadaf has conducted workshops and training sessions for her teachers. She is constantly working on creating fun and exciting activities to fully engage the children in the learning process. She is enthusiastic for shaping young minds to the thrill of learning regardless of learning styles or difficulties. Falak is a teacher and trainer of Jolly Phonics and has spent some of her time working with Fatima-Tuz-Zahra at Phonics Club; a learning center specifically teaching with the Jolly Phonics method. 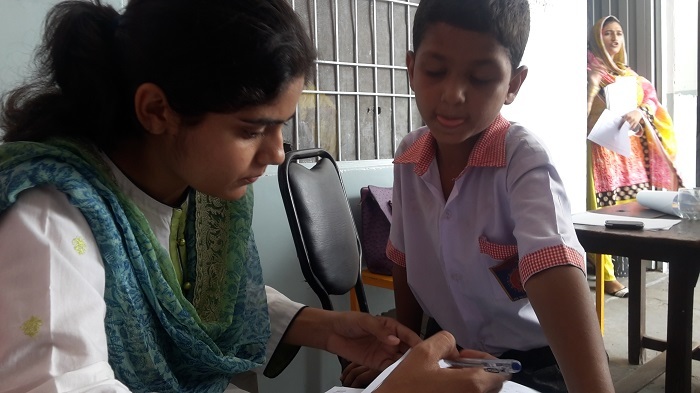 Falak has independently taught many children over the years, and when using Jolly Phonics she was so impressed with the speed and enthusiasm of the students’ learning that she now uses nothing else. 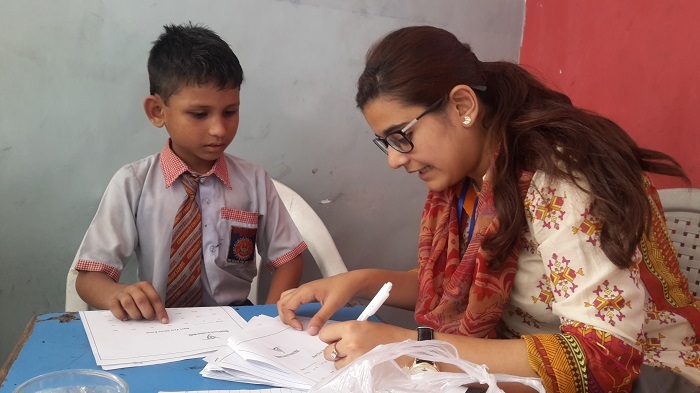 Falak is now eager to pass on her experience and knowledge of Jolly Phonics so that other teachers and parents can benefit their students and children they are teaching. Her target is to spread Jolly Phonics across the whole of Pakistan to ensure the country meets international educational standards. I have graduated in Economics & Finance; however, my professional inclination is in training and development, early childhood education and child psychology. As a person, I love travelling, meeting new people, discussing ideas and exploring new opportunities. I have been teaching and specializing in junior grades since 2012. I am a freelance trainer and have been training teachers, school administrators and parents on a regular basis. I believe that in a country like Pakistan, with a population of more than 190 million, there is a huge need for early childhood educators and professional trainers. Therefore, I decided to tap into this area so that I can wide the spread of my knowledge. 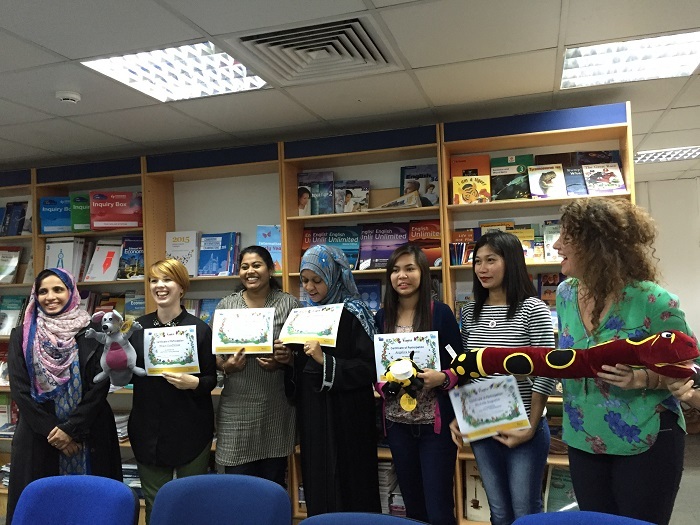 Fatima Aftab is Manger Research and Evaluation for Research society for Synthetic phonics and Phonics Club. She joined Phonics Club as Co -Principal Investigator for the first Pilot study project for the PEF schools in 2015 .Later she served as Principal Investigator for the trial projects ran across Lahore and Karachi schools. Fatima is currently perusing her degree of M.S in Clinical Psychology and believes in following interdisciplinary approach.. As a psychologist I know that students learn best when they are taught alphabets, words and sounds using fun activities from narrating and asking them to repeat after you. As co-principal investigator for PEF schools along with my RSSP members I did evaluation of reading skills of grade 1 students prior to the introduction of synthetic phonics approach. Moreover I did monthly evaluation of schools for ensuring correct utilization of resources and jolly phonics concepts in classes. I wish success to Jolly Phonics approach which would ultimately help in taking synthetic phonics approach to hundreds of less privileged schools of Pakistan and picture of primary education would improve in Pakistan. 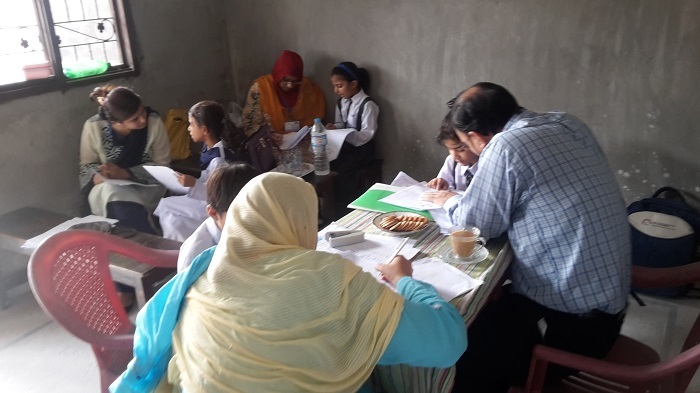 Successfully conducted baseline surveys and teachers evaluation for Introduction of Jolly Phonics Approach in Pakistan in PEF (Punjab Education Foundation) schools. 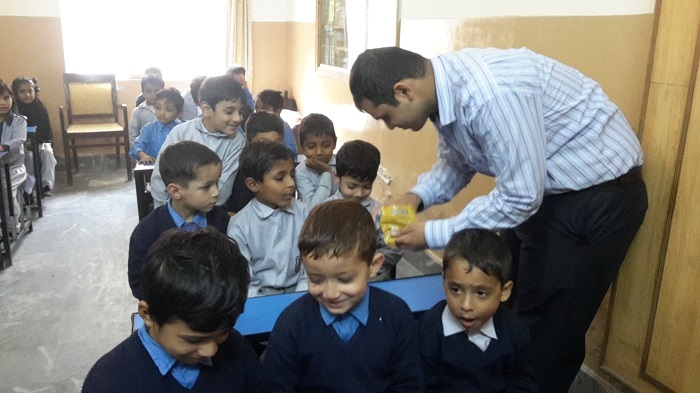 As Principal Investigator conducted Pilot studies and teacher evaluations for Six Afaq and 12 ITA (Idara Taleem O Agahi karachi) schools in Lahore and Karachi for introduction of UK based Jolly Phonics approach in Pakistan.